This delightful Iris has been in the Conservation Scheme for around 10 years but its valid name has eluded us until very recently. It is a medium bearded Iris growing to about 30cm tall and has white tepals with heavily veined markings in dark purple making a striking contrast to the flowers which make it stand out at the front of the border. It seems to be a variation from the wild form of Iris variegata where the tepals are usually yellow rather than white and the markings more brown to violet. A native of central and Eastern Europe, it flowers in May/June, needing a well-drained soil in full sun. It is not difficult to grow which makes it all the more surprising that it is not more widely available in cultivation. Propagation is by splitting the plant after flowering has finished but leaving at least 3 ‘fans’ on each piece to allow the plant to recover more quickly. The correct name of this plant eluded the Conservation Scheme because it was originally introduced under one later found to be invalid – being purchased under that name from Boughton Dower House over 30 years ago by Penny and Roger Gray (Hardy Plant Society members) who introduced it to the scheme. However, with persistence and eventually finding contacts who have been able to provide the identification we now have a valid name which was published in an article in the 2017 Yearbook by the British Iris Society. 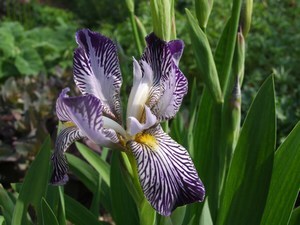 The Conservation Scheme was able to donate a piece of this unusual form of Iris variegata to Kew Gardens in appreciation. Sincere thanks go to Tony Hall (ex Kew) whose interest was sparked sufficiently to undertake further research which culminated in the article for the British Iris Society. Thanks also to Brian Mathew, now President of the BIS and Iris expert who provided initial suggestions for naming this variant and in consulting with Tony Hall. 0 Comments To "April's Conservation Feature"